After years of being away from my hometown, Fredericksburg, my family and I made the decision to come home in 2007. I have joined in the family business, CC Herber Co., Real Estate, with parents, Clinton and Ella Mae, and brother, Treff. We are fortunate and grateful to call this wonderful community home. With twenty-three years of real estate experience, including appraisal, counseling, management, brokerage, and handling all aspects of real estate ownership, I feel my background benefits both sellers and buyers. If you are looking to sell or buy in the beautiful Texas Hill Country, call today, and put me on your team. I will work hard and diligently to ensure you get quality service and satisfactory results. 23 Years Real Estate Experience. Licensed Texas Real Estate Broker. 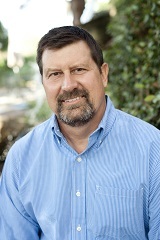 Texas State Certified General Real Estate Appraiser. MAI Designation from Appraisal Institute. Masters in Land Economics & Real Estate & Bachelors in Agricultural Economics, Texas A&M University. 8 Years as Commercial Real Estate Appraiser/Consultant. 14+ Years at Frost Bank, San Antonio, as VP in Trust Real Estate - Farm and Ranch Division. Family: Married to Mandy Phillips of Pearsall, one son and one daughter.